One can only wonder how long it will take before Europeans particularly in Spain, Greece and Italy, begin to take that advice. The Euro system amplifies shocks. Monetary union without fiscal union, economic integration without high levels of interstate mobility, enforced austerity in the weakest economies. And now the precedent of deposit confiscation. The only indicator that seems to be rising throughout the Eurozone is the number of protest signs comparing Angela Merkel to Hitler. Romano Prodi famously noted that the Euro system was weak, and that necessary reforms would be made when the time came in order to make it sustainable. Well, the Cyprus bailout and deposit levy, the national and international outcries and the subsequent “no” vote in the Cypriot parliament are all signs that in the wake of all the bailouts of the periphery that Europe is far from fixed. The necessary measures have not been taken. While the ECB may have taken measures to lower government borrowing costs in the periphery, the situation is in many ways — especially unemployment — still deteriorating. In fact, it seems like Eurocrats are trying to enforce the opposite of what might be necessary for sustainability — rather than installing a mechanism to transfer money to weakened economies suffering from high employment, Eurocrats seem to be trying to do everything to drive unemployment higher in the periphery, spark bank runs, as well as aggravate tensions with Russia. This is a crisis of institutions and a crisis of leadership as well as a crisis of economics. Merkel cannot lead Europe and Germany at the same time, because taking steps to revive the ailing Southern economies hurts her standing with the German and Northern public. The Eurocrats have asked for a bank run by demanding depositor haircuts in Cyprus. The public would not be at fault for giving them one. Farage’s advice is wise. A lot of analysts, including myself, have given the European situation a rest since last year. There were certainly some signs that the ECB and IMF had slowed (if not stopped) the deterioration by providing liquidity backstops to the addled banking system. But perhaps that was just the calm before the storm. In truth, things were still was probably just as perilous as ever up until yesterday when the ECB and IMF decided to start a banking panic by enforcing a haircut of up to 10% on bank depositors. That was literally the stupidest thing that anyone has done since the Euro crisis began, and while it may not lead to utter disaster, there is a significant chance that it will. Not only is it excruciatingly unjust (it’s theft! ), it is also incredibly suicidal. Many, many Spaniards, Italians, Greeks and Portuguese will have looked at the Cyprus haircut in horror, and wondered “Am I next?” Some of those will withdraw their money from the bank and stuff it in a mattress or into tangible assets, furthering stressing the already-fragile and highly-leveraged European banking system. Even a 1% drop in European deposits would lead to over €100 billion of withdrawals. 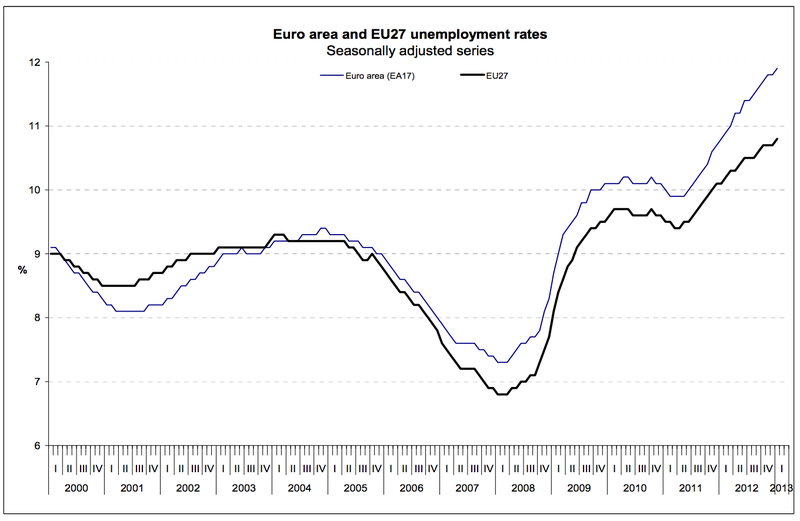 If bank runs materialise across Europe next week, the unemployment situation is most likely to worsen even further. 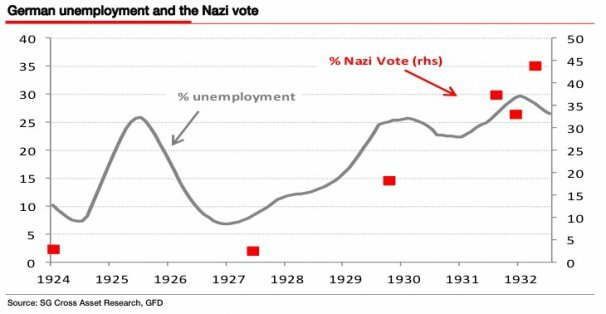 If that happens, expect more and more unemployed, underemployed and angry Europeans to start voting for increasingly radical political parties. This is suicidal. Europe needs to not only reverse the awful, stupid Cypriot haircut, but also to put fiscal consolidation on hold (it has, lest we forget, so far been counterproductive) and start worrying about unemployment levels. Greeks Want to Stay in the Euro? Why Don’t They Move to Germany? About 80.9 percent of Greeks believe Greece should struggle to stay within the eurozone “at any cost,” fresh opinion polls showed on Wednesday. Some 45.4 percent of respondents in a survey conducted by GPO firm for local private television Mega channel said that they regarded as most probable a Greek exit from the European common currency. And 48.4 percent of the respondents said that such a prospect was less likely. So the question is why don’t they leave Greece and move to the core where companies are hiring and public services aren’t being slashed, and where there is no overhanging threat of being thrown out of the euro? 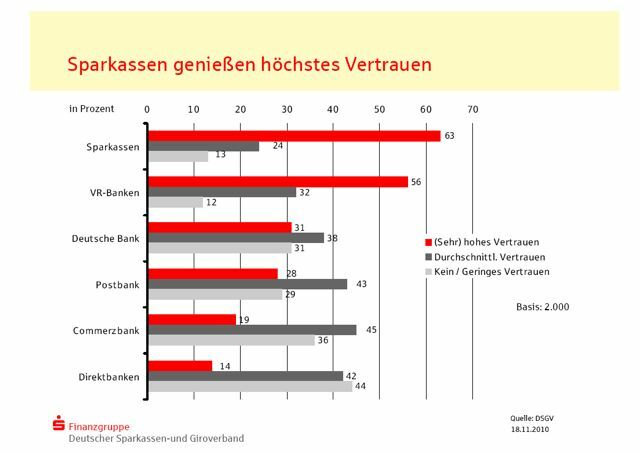 Conducted in January by the Focus Bari company using a sample of 444 people aged between 18 and 24, the study shows 76% of interviewees believing that leaving Greece would be the best response to the effects of the economic crisis. However, for most of them, the idea of leaving appears a dream that cannot come true. Half of those interviewed (53%) spoke of having thought about emigrating, while just 17% said that they had resolved to leave the country and that they had already undertaken preparatory actions. 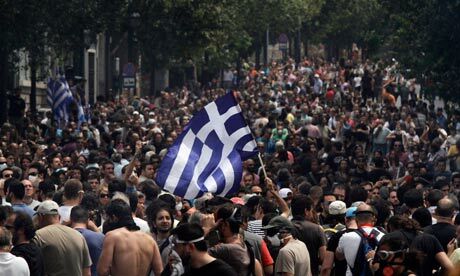 A slightly lower percentage (14%) stated that they were forcing themselves quite consciously to stay in Greece, as it is their generation that has to bring about the changes that the country so desperately needs. Who can claim benefits in the European Economic Area (EEA)? Just twelve months of work separates a jobless young Greek and austerity-free arbeitslosengeld. 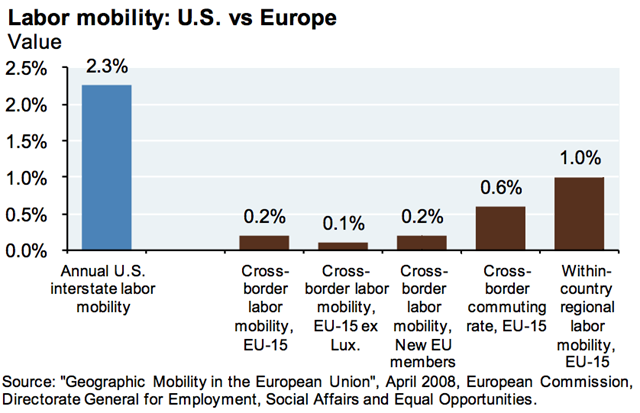 The fact that labour mobility is low in Europe is indicative of a fundamental problem. In any currency union or integrated economy it is necessary that there is enough mobility that people can emigrate from places where there is excess labour (the periphery) to places where labour is in short supply. Now, there is free movement in Europe, which is an essential prerequisite to a currency union. But the people themselves don’t seem to care for utilising it. Why? I can theorise a few potential reasons people wouldn’t want to move — displacement from friends and family, moving costs, local attachment. Yet none of those reasons are inapplicable to the United States. However there are two reasons which do not apply in the United States — language barriers and national loyalty. It is those reasons, I would suggest, that are preventing Europe from really functioning as a single economy with a higher rate of labour mobility. But long-term and deep-seated issues like language barriers and nationalistic sentiment cannot simply be eroded away in a day with an economic policy instrument. No bond-buying bazooka can smooth the underlying reality that Europe — unlike the United States — is not a single country. Greeks who want to stay in the euro in the long run would do well to move to the core. In spite of the fact that 85% of Greeks want to stay in the Eurozone, I was reasonably confident that Greeks would support Syriza to a first-place finish, and elect a new government willing to play chicken with the Germans. However Greeks — predominantly the elderly — rejected change (and possible imminent Drachmatization) in favour of the fundamentally broken status quo. But although Syriza finished second, the anti-bailout parties still commanded a majority of the votes. And New Democracy may still face a lot of trouble building a coalition to try to keep Greece in the bailout, and in the Euro . There has long been a rumour that Tsipras wanted to lose, so as to (rightly) blame the coming crush on the status quo parties. What fewer of us counted on was that the status quo parties wouldn’t want to win the election either. The pro-bailout socialists Pasok have thrown a monkey wrench into coalition-building by claiming they won’t take part in any coalition that doesn’t also include Syriza. This seems rational; when the tsunami hits, all parties in government will surely take a lot of long-term political damage. Pasok have already been marginalised by the younger and fierier Syriza, and Pasok presiding over an economic collapse (for that is undoubtedly what Greece now faces) would surely have driven Pasok into an abyss. The economy is such a poisoned chalice that parties seem willing to fight to keep themselves out of power. And with more austerity, it’s only going to get worse. 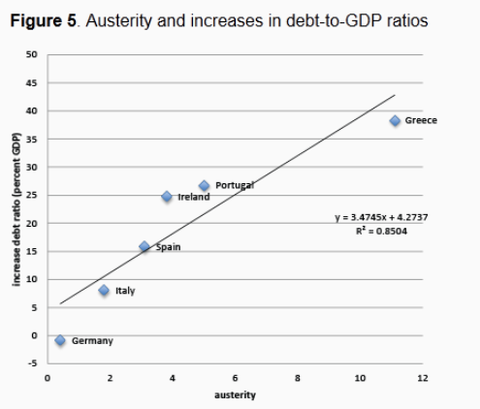 Once a society is hooked on large-scale debt-fuelled state spending, austerity in the name of government deleveraging is tough enough when the economy is booming, but during a depression as spending falls, tax revenues fall, very often producing (as has been the case in Greece, Spain, Portugal and the UK) even bigger deficits. International economics is a fast game. It’s only sixty years since America was exporter and creditor to the world. 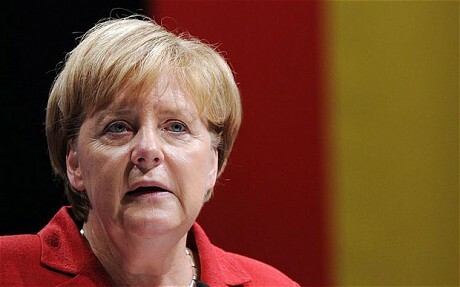 It’s only fifteen years since the now-booming German economy was described as the “sick man of Europe”. The same Euro system that is slamming Greece, Portugal, Spain and Italy today — in the aftermath of bubbles caused by easy money flowing into these countries as a result of the introduction of the Euro — could (if it were to somehow survive) do the same thing to Germany in ten or twenty or thirty years. A monetary union without a fiscal union is a fundamentally unworkable system and Westerwelle, Schauble and Merkel insisting that Greece play by the rules of their game is just asking for trouble. And trying to introduce a fiscal union over a heterogeneous, tense and disagreeable land as Europe is just asking for political trouble. No matter how many nations are browbeaten by fear into committing to the status quo, it still won’t be sustainable. 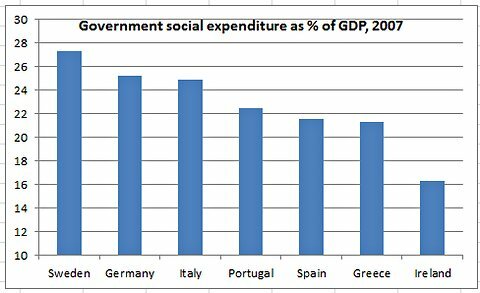 Greeks (and the other peripheral populations) can commit to austerity from here to eternity, but it won’t stop those policies resulting in deeper contraction, and more economic catastrophe. But the collapse of the Euro would at most-recent estimates cost the core and particularly Germany a lot more than handing over the money to the PIGS. Eventually they will hand over the money to shield themselves from falling masonry. The real question is whether or not the entire system will spiral into pandemonium before Germany blinks. Just as I predicted Germany is getting restless at the idea of bailing out the bulk of Europe. Andreas Vosskuhle, head of the German constitutional court, said politicians do not have the legal authority to sign away the birthright of the German people without their explicit consent.”The sovereignty of the German state is inviolate and anchored in perpetuity by basic law. It may not be abandoned by the legislature (even with its powers to amend the constitution),” he said.”There is little leeway left for giving up core powers to the EU. If one wants to go beyond this limit – which might be politically legitimate and desirable – then Germany must give itself a new constitution. A referendum would be necessary. This cannot be done without the people,” he told newspaper Frankfurter Allgemeine. Turns out that listening to Germans in the German government, and on the German street might have more bearing on reality than listening to globe-trotting, world-saving, hopium-pedling, six-pac-abs, tax-evading Timothy Geithner. For example, German finance minister Wolfgang Schauble. He might be in a position to comment (or a better one than Geithner, in any case). So if Germany won’t bail out Europe (until things get much worse) and China and the BRICS won’t (until things get much, much worse) then who will? China and the U.S. finally found something to agree on: Europe is doomed and might take the world’s two biggest economies down with it. Neither officials in Beijing nor Washington are actually using the “D word.” They don’t need to, not with Zhou Xiaochuan, China’s central bank governor, talking matter-of- factly about emerging nations bailing out the euro region and U.S. Treasury Secretary Timothy Geithner warning of “cascading default, bank runs and catastrophic risk” there. The price tag for keeping the Greek-led turmoil from killing the euro is rising fast. Asians are so anxious about it that they’re querying Americans — like me. In my travels around the region this month, I’ve faced a harrowing question: Would U.S. President Barack Obama chip in for a giant European bailout? It’s hard to decide what’s more disturbing: the obvious answer — over Republicans’ dead bodies — or the fact it’s being asked at all, and by whom. Among those posing it were the finance minister of one Asia’s biggest economies, the central bank governor of another and a number of major executives. 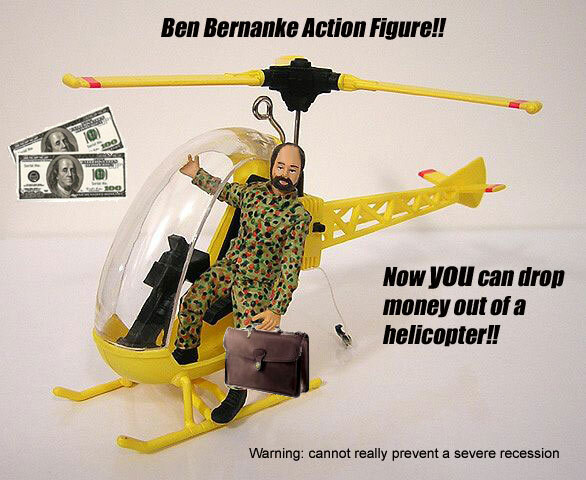 After all, the closest thing to concerted action on Europe so far has come from Bernanke. It’s the same absurd predicament — Americans pay for global stability, everyone else benefits.